Do you remember when Apple told you to think different? September 28, 1997: Apple debuts its iconic “Think different” television commercial, aligning the troubled computer company with some of history’s most famous freethinking rebels. The most famous tagline in Apple history, “Think different” doesn’t just articulate how Cupertino differs from its competitors. It also highlights how Apple, under the leadership of Steve Jobs, will forge a future far different from its floundering, money-losing days of the early 1990s. Black-and-white images of more than a dozen 20th-century visionaries, from Albert Einstein and Buckminster Fuller to John Lennon and Martin Luther King Jr., flow past as masterful marketing copy praises the power of bold ideas. In the most cynical terms possible, the new marketing blitz served as a stalling tactic for Apple. It was an attempt to convince shareholders and customers that things would be different under Jobs, despite a lack of new Apple products. While Jobs’ return was viewed with excitement by most fans, it didn’t go unnoticed that the most significant thing he had done so far was to announce one of the biggest quarterly losses in Apple history. Unlike most things that come out of Cupertino with no forewarning, Apple actually tried out “think different” in advance. Call it a lack of confidence. 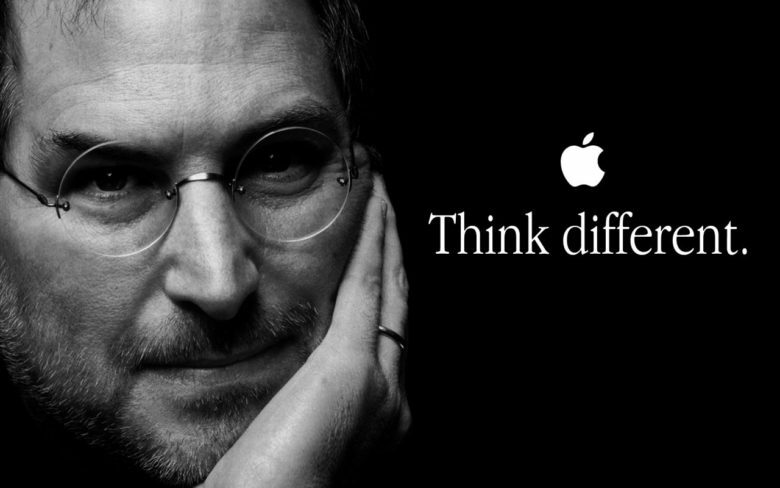 Or a savvy move to make “think different” seem less marketing slogan and more grass-roots spontaneity. Whatever the case, this Apple ad campaign was, well, different. 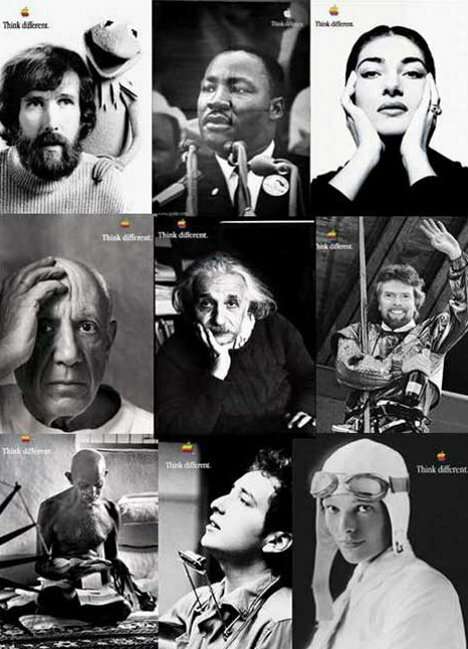 Some of the original “Think different” posters. The ad copy itself sprang from copywriters Rob Siltanen and Ken Segall (the latter of whom also named the iMac). Jobs himself was persuaded to record a version of the ad narration, but didn’t allow it to air for fear that people would consider it arrogant. Jobs originally wanted to use one of Robin Williams’ inspirational speeches from the move Dead Poets Society for the commercial, until Siltanen and Segall wrote the “Here’s to the crazy ones” copy. This idea clearly stuck around with someone at Apple, however. The company wound up using the Williams audio sample for one of its “Your Verse” ads for iPad in 2014. Apple discontinued its “Think different” ad campaign upon the arrival of the iMac G4 in 2002. However, the ads’ impact continues to be felt to this day — as a kind of guiding-light mission statement, similar to the Apple Values manifesto of the 1980s. What’s your favorite Apple commercial? Do you think Apple still lives up to its “Think different” mantra? Leave your comments below.